Last week I posted about how to make a DIY lace frame jewelry holder, which I needed as a gift for a middle-school graduation party. Here is a peek at the Hawaiian-themed party itself. First, I'd like to report that as a grown-up person, I am still completely entranced by Barbie. 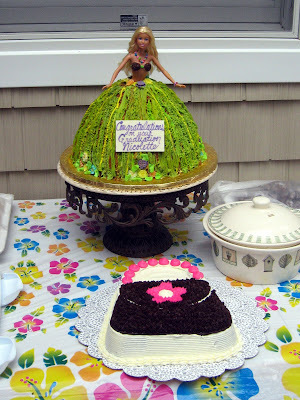 The Barbie cake came from a bakery in Levittown. The pocketbook cake was made by my amazing young friend Liana, a girl after my own heart who used a coupon when buying the cake mold. 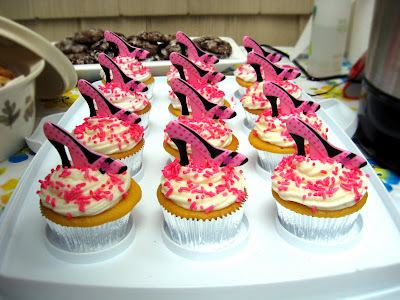 She also made all of the cupcakes. Lemon, mmmmh. Michaels, because they have a 40-percent off coupon in the paper almost every week. 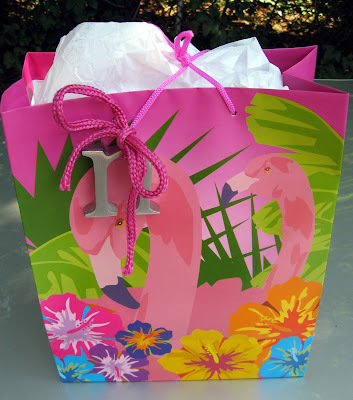 As for the gift, I bought a tropical gift bag at The Dollar Tree. You may recognize the metal initial from the stoop giveaway of last Saturday. The pink tie came from an Ann Taylor shopping bag Tom found in the recycle bin. If I bought everything at full price, this little gift would have added up to about $60. As it is, I spent exactly one buck - on the gift bag. p.s. For tips on dollar store savings, check out this post at Thrifty Little Blog. so fun! love the desserts! 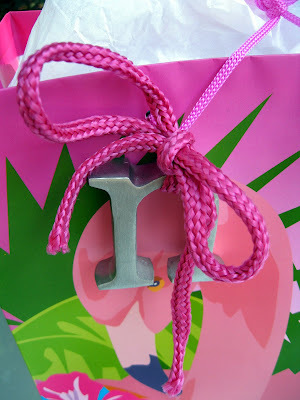 the bag is really cute w "n" attached too. I'm glad that you found such a cute/ cheap/ theme-related bag... and that you were able to go to a party with three different cake options!! I had a bite of all three. 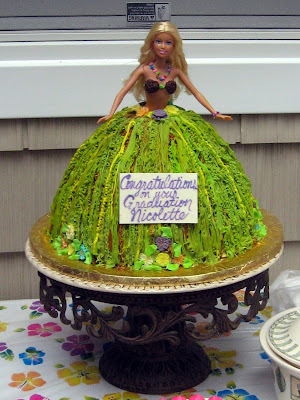 That Barbie cake is awesome. You should send it in to that cake blog (Cake Wrecks?) where people send in weird cakes.